Just hours after JPM's Marko Kolanovic doubled down, and after "explaining" this week's rout with Wednesday's "severe snowstorm" told CNBC to "buy the dip", JPM's chief technical analyst Jason Hunter had an entirely different message. 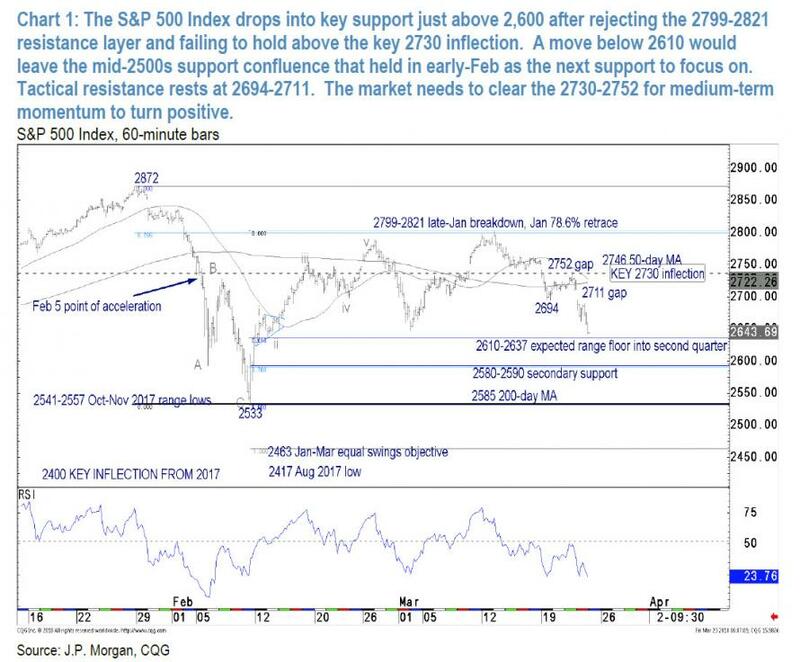 Contrary to JPMorgan's head quant, who sees the S&P hitting fresh all time highs soon, Hunter warned that the recent S&P decline, which failed to breach 2,800 resistance and broke through key support at 2,730 is "challenging our base-case outlook for an eventual recovery to new highs into the second quarter." And while the chartist notes that a slump is not (yet) "the most probable outcome", and that he does not envision a material break below support in the mid-2500s, he urges clients to reduce exposure should the S&P slide below 2,610. In other words, in true "guaranteed to lose money" fashion, buy if others are buying, and sell when others sell. Sarcasm aside, and before we show the chart that lays out all of JPM's support and resistance lines, the JPM technician makes an interesting detour into how he approaches late-cycle market corrections - such as this one - that have unfolded before the 2s/10s UST curve inverted during past cycles since 1980. What JPM finds is that in virtually all cases, the peak to trough price damage was limited to 10% on a close to close basis, and by day 40 after the peak, the market had found solid ground. 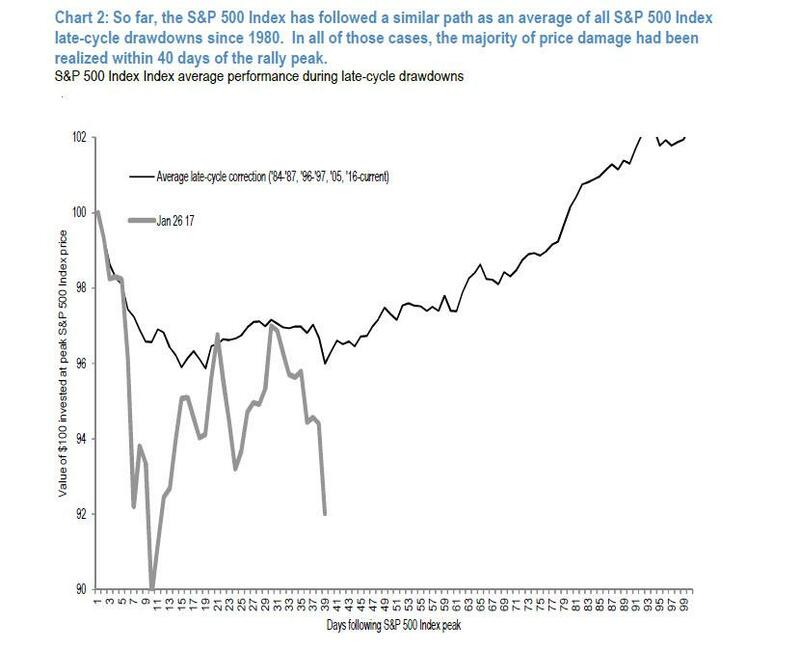 JPM shows the average trajectory of all the S&P 500 Index drawdowns that exceeded 5% during the late-cycle periods before curve inversion in the chart below. And while until a week ago, the post-correction recovery thesis was solid with the market since the January 26 highs tracking closely to the average reaction, last week's events have clearly violated this relationship and suddenly the BTFDers are getting cold feet. What happens next? 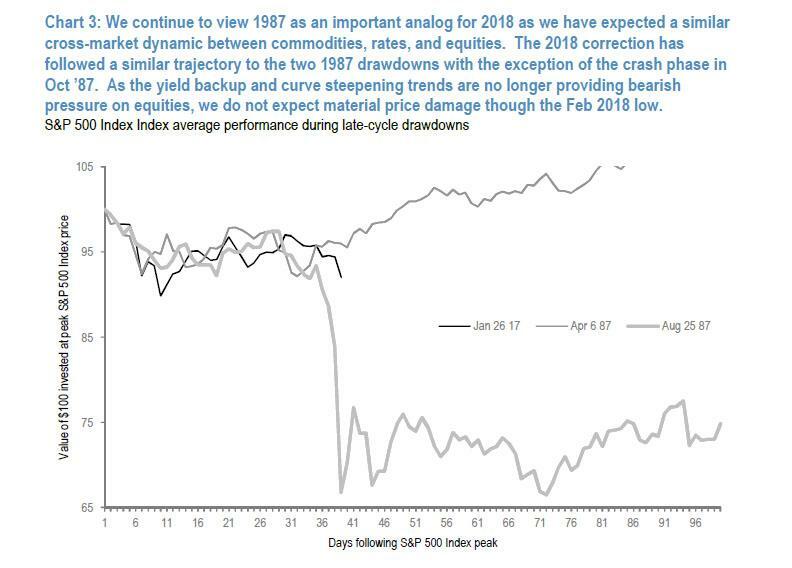 Well, it could get messy, because according to Hunter, JPM continues to view 1987 as an important analog for 2018, "as we anticipated a similar cross-market dynamic heading into the year whereby interest rate and curve volatility could be a primary driver for volatility in the equity market." "In 1987, both correction periods traced out a remarkably similar path up until about day 35 from the peak. In the Apr-May period, the S&P 500 had established a well-defined range support zone with the initial pullback. The market had gone on to retest and hold that support in late May ahead of a powerful 20%+ rally to the Aug peak. The initial drop from that peak into Sep 1987 established range support in Sep, just as the market did in spring. Except the mid-Oct retest of that support failed to hold." In other words, in 1987 it was roughly 40 days past the prior peak that the S&P decided whether to keep going higher, or crash. If indeed the current market is an analog, the S&P faces a similar choice now. We suspect that a confluence of stop orders through that support and the 10% peak to trough correction threshold triggered or at least contributed to the market dynamic that defined the three-day crash event. It is also worth noting that the aggressive trend to higher Treasury yields and curve steepening reinforced the equity weakness until the May and Oct 1987 bottoms. Even during the brief crash episode, the trend to higher rates reinforced equity weakness up until the last day of the meltdown. As far as that cross-market driver goes, the aggressive trend to higher yields and early-2018 curve steepening moves have in part reversed, so we see a low probability that the equity weakness resumes with the same momentum it had in early Feb. Unless, of course, it does... which is why JPM urges to keep a very close eye on which way the S&P will break next. And while another ramp higher obviously removes the risk of another "1987" event, a move below the 2,610-2,637 support confluence would leave the market susceptible to a retest of the key support in the 2,500s that held in Feb, according to JPM. Hunter's recommendation: "we suggest at least partially reducing the new long exposure accumulated during the Feb turn and on the early-Mar pullback if the market breaks below 2,610." The 200- day MA has risen to 2,585, which sits just above the 2,541-2,557 Oct-Nov 2017 range lows and 2,533 Feb 15 trough. That area also roughly lines up with the 10% peak to trough threshold, an area that marked a floor for the majority of late-cycle drawdowns. Even if further weakness materializes, we think the market will hold that area, but would wait for a reversal pattern to set up before suggesting re-entering any long exposure reduced on the break below 2,610. Longer-term support rests at the 2,463 Jan-Mar equal swings objective, 2,417 Aug 2017 low, and 2,400, which marked a key inflection in 2017 – first as resistance and then support.